The experience accumulated since the creation of the cooperative places us among major organizations of transport of the autonomous community of Galicia. Thus, an average of more than 500 transports per month, for no less than 100 customers is managed currently, both national and international. We deal with managing returns, in order to make profitable the activity of partners and ultimately of our customers. TRANSPORTES DEL LEREZ SOCIEDAD COOPERATIVA LIMITADA, was founded in 1992 grouping 51 partners. They contributed with their experience and their knowledge of freight transport sector to create an organization capable of leveraging synergies in customer acquisition and work in the province of Pontevedra. Since then, the company underwent through several phases, until reaching 62 current partners. At present, the Company provides transportation services in all Spain with head truck and semi-trailer for general merchandise, both national and international goods transport. 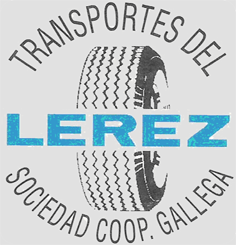 In the year 2004 adaptation of the statutes was set up according to law of Cooperatives in Galicia, 5/1998 of December 18, changing its name to TRANSPORTES DEL LÉREZ SOCIEDAD COOPERATIVA GALLEGA. · Transport of goods by road. · National and international coverage. · Coordination and management of transport from origin to destination. Our level of service and fulfilment are the best guarantee for the satisfaction of our customers, which has allowed us to develop the track record of the Company on its own. Our commitment and good work are guaranteed by ISO 9001:2008 Certificate, seeking to provide the best quality service. © Copyright - Trasportes del Lérez S.C.G.